BROWN - A new and Accurate map of China. . .
BROWN, Th. - A new and Accurate map of China. . .
A new and Accurate map of China. . . - BROWN, Th. 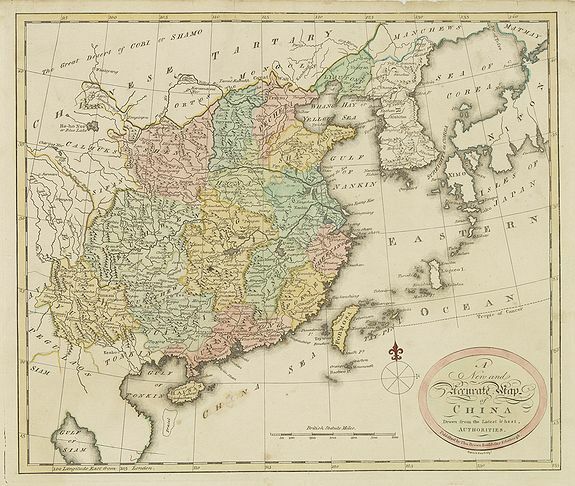 Title : A new and Accurate map of China. . ..
Map maker : BROWN, Th.. Size : 13.7 x 17.5 inches. / 34.7 x 44.5 cm. Description :Map of China, including Taiwan and Korea. Engraved and published by Thomas Brown, who was active as map seller in Edinburg. Engraved by Gavin and son. From Brown's seldom seen "General Atlas". The map is of interest for the use of East Sea, the sea between Korea and Japan, here called "Sea of Korea". Condition : Some discolouration and light staining of paper.